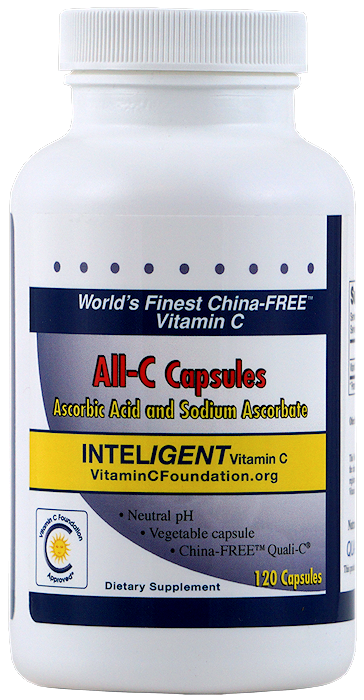 Home of the World's Finest CHINA-FREE Vitamin C.
We provide the highest quality vitamin C products on the market. Our wide-ranging vitamin C product line is made using DSM Quali-C® -- manufactured in Scotland, UK. 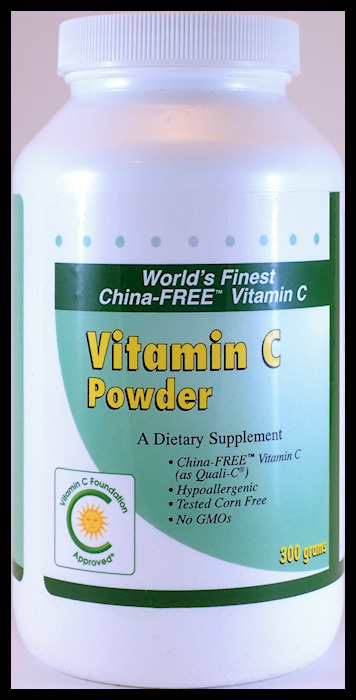 Note: More than 90% of all vitamin C in the world is currently manufactured in China. The DSM Quali-C® in our products is NOT MADE IN CHINA. Physicians and Retail Outlets use our products to enhance their reputation for quality. Physicians and retailer can order using our password protected wholesale accounts. Call our (800) 894-9025 number to obtain your wholesale password. Note, you will be asked to provide proof of your tax exempt status. DSM Nutritional Products (formerly Roche) was the first chemical manufacturer to synthesize ascorbic acid (vitamin C) shortly after the 1937 Nobel Prize. 80 years later, DSM's ultra high-quality vitamin C products are best-in-class. DSM certifies that their Quali-C® is hypoallergenic GMO-Free. Quali-C® vitamin C is tested to be free of corn and gluten. Click on an Information Box below for more detailed information. If first morning urine is too alkaline (high pH), switch to some or all ascorbic acid. 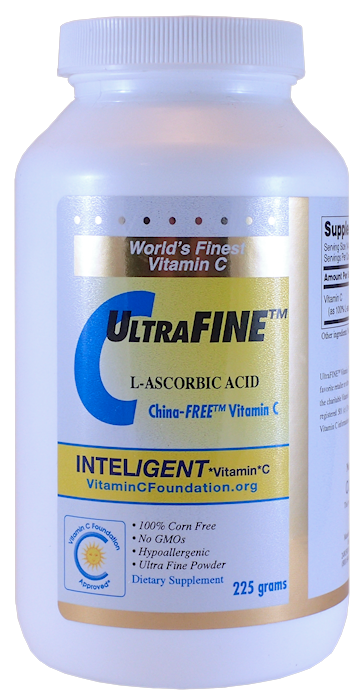 UltraFINE's basic properties are similar to our 300 gram "fine" Quali-C ascorbic acid powder, but with smaller particles, almost talcum powder-like, the product mixes better in water and more enters the bloods stream. Our customer base prefers this product when making their own "liposomal" or emulsified vitamin C.
The cellulose capsules are safe for vegetarians. Professionally manufactured True-liposomals (as opposed to self-made emulsions) anecdotally have special properties and effects, especially fighting infection. A True-Liposomal can deliver almost 100% of its "payload" (vitamin C) to the blood stream. The 150 nanometer liposomes persist long after ordinary vitamin C has been passed out of the body (i.e., up to 2 to 4 hours). True-liposomal is recommended by our physicians for all types of infections. 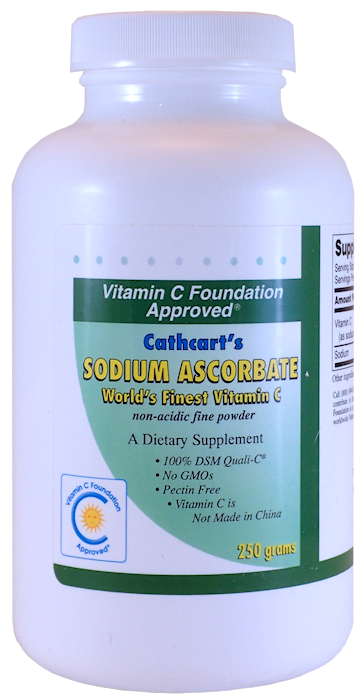 The product can assist those with very low vitamin C bowel tolerances to retain more C than by taking ordinary vitamin C powders. 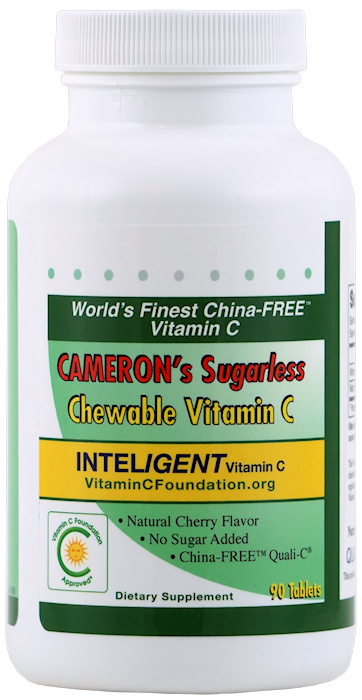 CAMERON's Chewable Vitamin C tablets - No Glucose (250 tablets as Quali-C®). 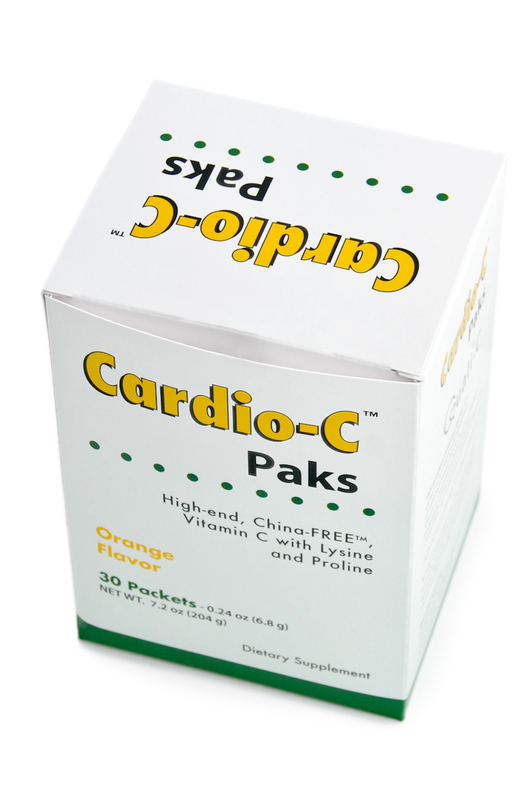 Cardio-C PAKS™ Individual Pauling-therapy Drink Mix Servings (Vitamin C as Quali-C®). 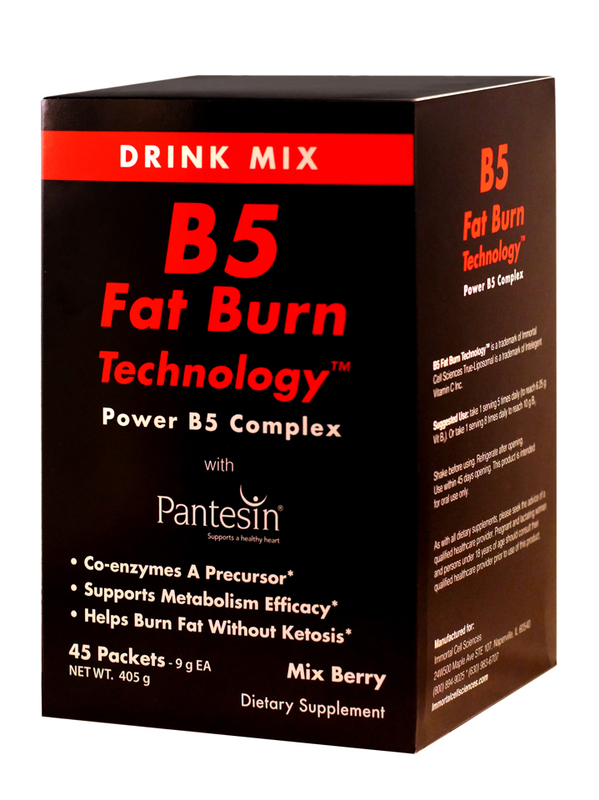 Our new B5 Fat Burn Technology.™ products are intended for dieters on low-calorie diets, and at higher dosages, for athletes to boost heavy workouts. The new technology combines a previous HGH (Human Growth Hormone) secretion formula (Ascorbade®) with the Hong Kong doctor Leung's Vitamin B5 weight-loss discovery. 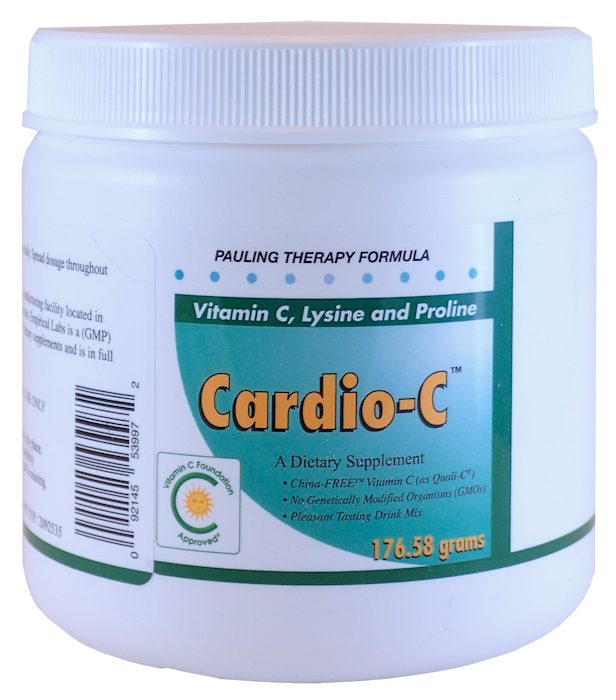 Cardio-C™ is a trademark of Inteligent*Vitamin*C Inc.
B5 Fat Burn Technology™ is a trademark of Immortal Cell Sciences. Pantesin® is a registered trademark of Kyowa Pharma Chemical Co.
Quali-B® and Quali-C® are registered trademarks of DSM Nutritional Products. 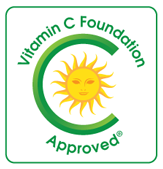 Vitamin C Foundation Approved® is a registered Vitamin C Foundation. PANACEA True-Liposomal® is a registered trademark Inteligent Vitamin C Inc.
Immortal Cell Sciences™ is a trademark of Inteligent Vitamin C Inc.